That line, made famous in the 1970’s movie Love Story, served ostensibly to teach us true love is blind to all faults and it is never necessary to apologize to those we love and who, in turn, love us. No apology necessary. That phrase was repeated around the world and triggered a debate as to the need, timing and appropriateness of apologies. 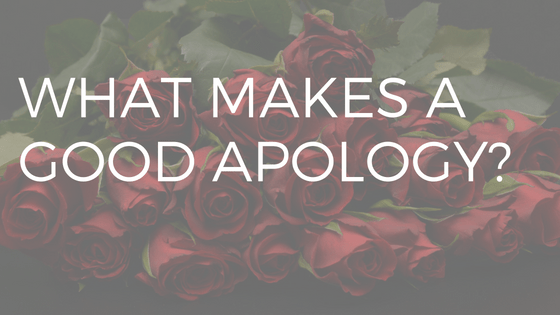 My view has always been that apologies are important, and necessary to both repair damage and mend relationships. Let’s face it, we all mess up at times and apologies are not only warranted, but also necessary. I have long subscribed to the principle of “mess up, fess up, dress up”. Essentially, what this means is when we do wrong, regardless of intention, the first step is to immediately claim ownership, take responsibility for our actions and then do whatever it takes to make it right. I’m sure the debate on this topic is as broad as the one on the correctness of “love means never having to say you’re sorry.” The correct way to apologize is not guided so much by what we say, but rather by what we omit. An apology should be a statement of ownership of culpability. And yet I can think of only a few occasions where I have witnessed an apology (and, on occasion, been the apologizor) that have not been accompanied by a detailed explanation/justification/rationalization for why a decision was made to act in a certain way. To me, this is nothing more than an attempt to minimize the seriousness of the offense by using an explanation as a way of explaining that, in the moment, we thought our chosen behaviour was the best choice to make. It is what we do to minimize our culpability. Regardless of the validity of the reasons given, an apology is not about saying sorry for why we did it, it is about saying sorry that we did it. We are apologizing for our behavior, not our thought process. Anything said after “I’m sorry” suggests inauthenticity fueled by a belief that motive equals justification. I have had senior managers and leaders in both the pubic and private sectors tell me that apologizing to subordinates is a sign of weakness and there is never a need for them to either explain or apologize for their behavior. They couldn’t possibly be more wrong. The real weakness lies in their unwillingness to offer an apology. Regardless of our position in a hierarchy or where we place our perch on the ladder, we are all fallible, we have all made mistakes in the past and will continue to do so in the future. Apologizing shows strength and reveals character. Mistakes provide opportunities for learning and a sincere two-word apology is the catalyst for the anger/pain/disappointment to stop and the learning to start. If it starts with “I’m sorry but…” then it isn’t an apology.